Learn how to make a fish shaped chopstick wrapper, this resembles the carp Koinobori streamers. Easy and fun to make. You can also use napkins to wrap cutlery. These fun chopstick or cutlery wrappers are great at kids parties, especially if you use a napkin to make them. Your guests can then unwrap the napkin to use. 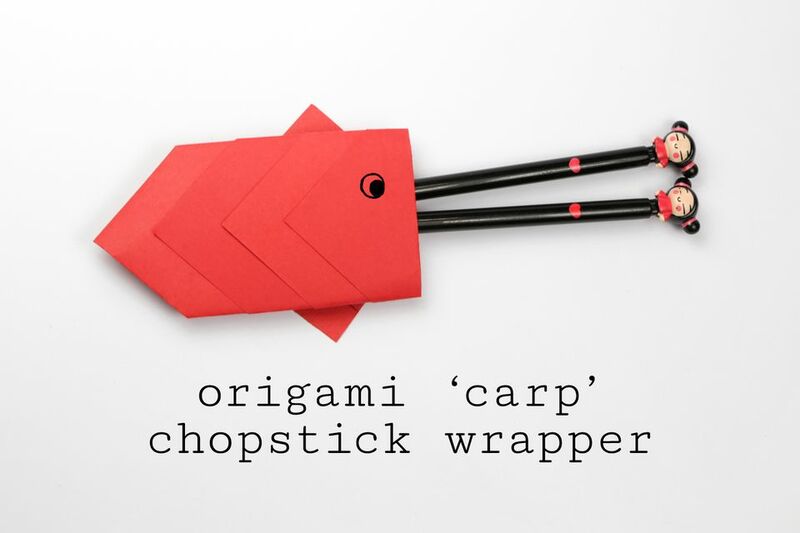 This is a modification of the traditional origami cutlery wrapper. You can see many Koinobori or carp steamers in Japan, especially in April and May, they are decorations for 'Childrens Day' on May 5th in Japan. The fish represents the Carp that can swim upstream, symbolising strength and hard work. Find out a bit more about the tradition here. For this you will need either a square piece of paper or a napkin. The larger the better, and if your paper has different colours or patterns on each side, you will end up with a striped effect. For more party origami, check out the Easy Traditional Origami Turtle - great as a chopstick rest, to serve snacks use the Round Origami Sectioned Box, or the Origami Hexagonal Dish, there is also the Origami Boat Dish. 1. Starting white side up if you have one, fold the bottom edge up to the top. 2. Fold the left edge to the right. 3. If you're starting with a napkin, it would already be like this. 4. Fold the top layer from the top right corner down, leaving a gap. How big you make this gap is up to you. 5. Continue folding all the layers, leaving gaps. Leave the last one. 6. Rotate the model and then flip it over to the other side. 7. Fold the right corner inwards, how much is again up to you. 8. Fold the left corner inwards the same amount as the right, if you need to double fold the corners, do that. 9. Flip the model over and fold the top point down and behind. 10. If you want to give your fish fins, open the top flap and fold the left and right flaps out a bit. 11. Refold the top flap. 12. Now you can pop some chopsticks in it. You can make these different widths and if you have a napkin, this can be used for cutlery too.